Its basic functionality is to manage space by freezing unused apps on your device, making them appear as though they weren't installed on your phone. Somehow, this app presents a basic challenge to some Infinix users. Most of them have been searching for solutions to the app freezer disappearing suddenly. Well, the truth is that, the app does not disappear suddenly. It’s either it has been mistakenly disabled or a different launcher is being used that doesn’t support the display of the app. The discouraging side is that you won’t be able to unfreeze or manually freeze some apps again since you can’t access the app freezer. While many users are still surfing the net in search for a solution, you’re lucky to have come across this post. In it, I have described how you can unhide or recover the supposedly disappeared app freezer with ease. In this post, there are two approaches – tried and tested – that deliver the expected result. Depending on the scenario or peculiarity of your own case, one of them might just be right for you. Just ensure that you follow the guide to the letter. Interfaces might differ, but the overall working strategy remains the same. That is, once you understand how to swap between launchers, and equally access apps installed on your device, then you have a good shot at overcoming this problem. As I stated earlier, the hidden status of the app freezer might be because it has been disabled mistakenly, or by another app on the launcher settings. To fix this, you just simply need to enable it from the launcher. But wait a minute, do you know how to access the default XOS launcher settings on your Infinix device? I know exactly that this is where most of us might begin to ask silent questions – Where do I see the settings? Well, if you know how to access the launcher settings, then skip a few steps below. First, ensure that your phone is on the home screen. You can always do that by tapping the home button. While on the home screen, long-press any part of the screen. However, make sure that you’re not long-pressing an app, widget or any other element on the screen. Just an empty part of the screen is all you should long-press. This will display a series of options and buttons from the bottom of the screen. Tap on the Menu button to access the default XOS launcher settings. On the launcher settings, scroll down and tap Other settings to access settings of which enabling the app freezer is one. Depending on the size of your screen, you might need to scroll down or not at all, to locate the Freezer setting. Ensure that the freezer is enabled by tapping on it. For most XOS phones, the disabled state is symbolised with a grey colour, while the enabled state displays in green. Just ensure that it displays green to signify that it has been enabled. Ok, exit the settings and open the XOS family apps’ folder or look for the App Freezer on the list of apps installed on your phone. That should work perfectly for you. You can now freeze and unfreeze apps with the app freezer. It has been discovered that when the default XOS launcher is swapped for a custom launcher, the app freezer suddenly disappears. This is saddening because, some of us are fans of intriguing 3D launchers such as Next, Nova, among others. What that means is you cannot use the app freezer on a custom launcher. However, there is a way around it. Each time you intend to freeze or unfreeze an app, you will have to revert to the default launcher and access the app freezer, then return to your preferred custom launcher. Otherwise, you will have to stick with the preinstalled XOS launcher. Ok, now let’s see how you can revert to the default launcher. I know some of us are good with this one already. So, it’s not a concern. But for the benefit of those who do not know how to do this, let me quickly describe. First, you need to tap the apps’ icon or open the interface that displays all your applications. Remember that interface may differ depending on the type of launcher you’re using. So, you might need to scroll up and down, or swipe left and right to see the apps installed on your phone. 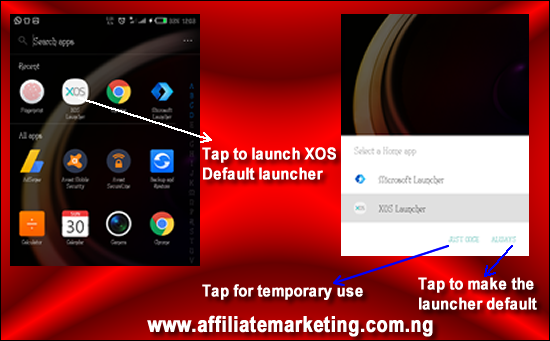 Look for the XOS Launcher and tap to launch it. Alternatively, search for it using any search feature available on your device. After launching the XOS Launcher, you might be prompted to set it as the default launcher by tapping Always or use it just this time only by tapping Just Once. The choice is up to you. If you intend to use your custom launcher, then tap Just Once, otherwise tap Always. Now, look for the App Freezer among your installed apps or the XOS family apps’ folder. 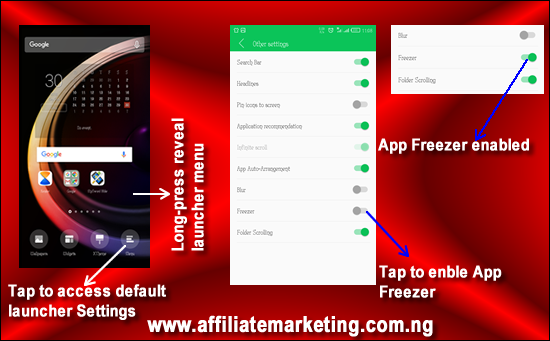 In case, after reverting to the default launcher, you still can’t find the App Freezer, ensure that it is enabled on your device. To do that, go through the first approach described above. All things being equal, after the above approaches, you should be able to see the app freezer once again and use it to freeze and unfreeze applications you have on your device. Sometimes, scenarios may differ and make solutions appear to be useless, or a user’s skills might be below expectations and as such make it difficult to follow steps as given. Either way, it is always good to share knowledge and experience in any way possible, so that others can find solutions and use their devices effectively. This post has been carefully created with the approaches duly tested. But that is not to imply that they are final in addressing this problem. 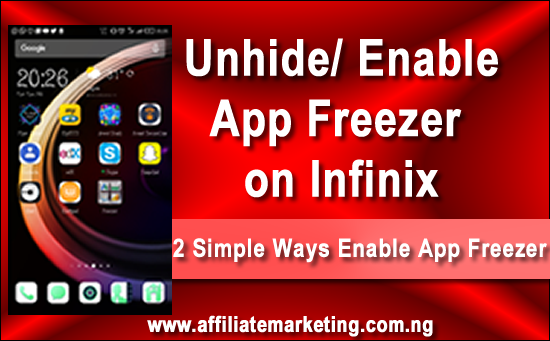 Other solutions you find that are safe and ensure that you find the app freezer on the device again, do make use of it. However, these are tested solutions found to be applicable to most of the Infinix smartphones. Above all, don’t forget to share you experience and approaches here to help others.